If you’re something of an avid online shopper like me you might know that feeling of excitement when you come across a site you haven’t seen before with loads of cute clothes and bargainous prices. You know that feeling when you’re like, “I want everything!” I totally felt like that when I stumbled on sheinside.com. They’re based in China but you can easily flick the currency to £, they do free worldwide shipping and my clothes arrived in just over a week. I ordered this horse print blouse and denim dress straight away and both are so lovely on. 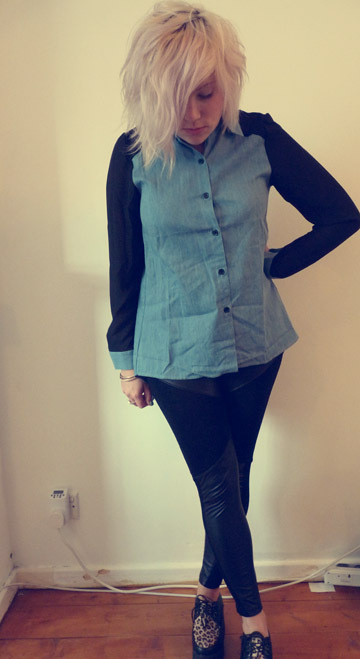 After my order they kindly let me pick something else from the website and I chose this denim shirt with chiffon sleeves (£20). I’ve realised now seeing the photos that I probably should have given it an iron but I couldn’t wait to wear it out! 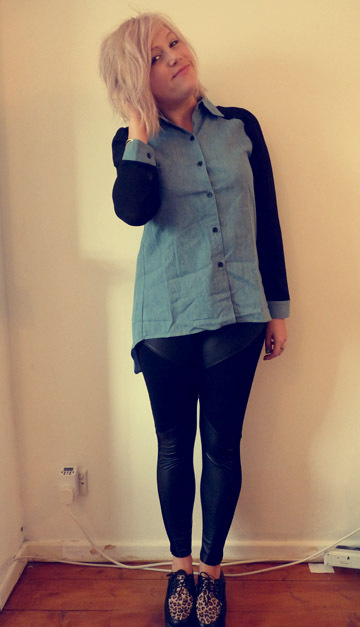 It feels a bit Rihanna-y to me so I had to team it with my leather panel leggings and creepers. What do you think?